It's important to VPSC that every public sector employee clearly understands what integrity looks like, and how to behave. We actively work with Victorian organisations to embed and communicate our shared values, principles, policies and accountabilities. Our Integrity Strategy sets out the specific program of work and details targeted activities we’re planning to complete over the next year. The one page infographic covers the key priorities for 2017. You can find more information outlining progress and reporting on past activity in the full strategy document. If you’re interested in any of our initiatives or want to know more about a 2017 project, please contact us. 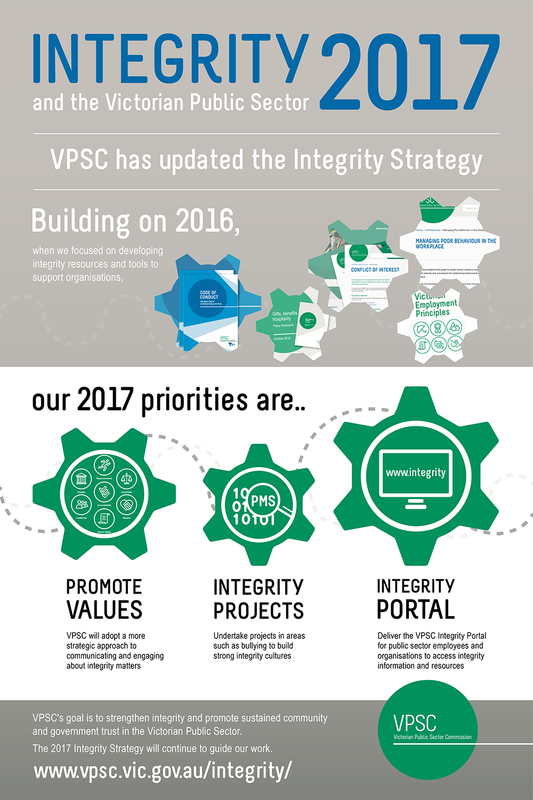 VPSC has updated our Integrity Strategy, outlining progress made on integrity initiatives in 2016 and detailing the program of work to to be undertaken in 2017. VPSC first released the Integrity Strategy in 2016.